We have a new laugh!! This past Sunday, Max and I were playing and having fun during his diaper change. He doesn't like the shirt changing process, so I try to make it fun for him. 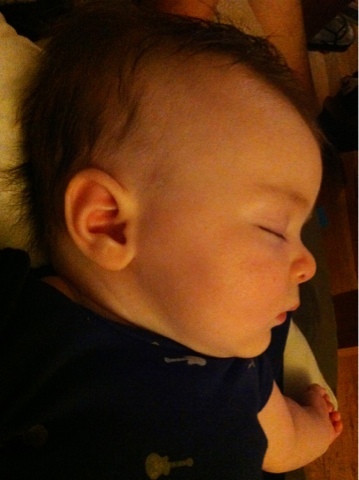 When I peel his shirt over his head, I loudly sing, "naked baby!" and he usually smiles and giggles. Oh, and kicking too (ouch, belly). This usually puts him in a good mood. I was blowing raspberries on his belly and giving him lots of goofy kisses all over his face. He started this amazing new belly laugh. It was awesome! I wish I could explain it in words. It's a beautiful little song that I really love hearing. I've been trying to capture it in video, but haven’t succeeded yet. He's such a happy little baby, and it makes it so fun to see when he's having a great time. He's getting so strong with his back. He's now sitting forward during story time, he refuses to lean back on mommy most of the time. He's sitting up straight, and if he loses his balance he leans forward a little and rests his elbows on his thighs for support. He just sits there and stares at the books. He always starts at the left page, scans it, and then turns his head to the right page. I love watching him. His current favorite book is I Kissed the Baby by Mary Murphy. The last couple of pages are his favorite part. He gets a big kiss when the baby in the book gets kissed, and then I quack with the duckling on the last page. He gets all excited and smiles and rocks back and forth. This past weekend we had a glitch in his sleeping schedule. He's been sleeping five or six hours straight since he was about six weeks old (trust me, I know how lucky I am for this!). Friday night he started waking every two or three hours. Sometimes it was to eat, other times he just wanted to be held. I'm cherishing each extra waking moment I have with him, so I love it. This lasted through Monday night, and he was back to normal on Tuesday night. I'm not sure if it was a growth spurt, but he definitely seems bigger to me! His legs are a whole other story. This little monster wants to stand a lot. He stands in my lap now, with just holding my fingers in his hands for stability! He gets all giggly and proud, with his loud squeals. It only lasts a few seconds, but it’s so fun to watch. He still doesn’t love tummy time, but he’s getting a lot better. He can lift his head and look around. He doesn’t push himself up with his arms yet, but he’s trying. I’m wondering if he’s going to try to skip the crawling phase and go straight to walking! I know that he probably won’t, but you never know!